I am writing to let you know that due to accepting a new job I will be relocating to Tennessee effective immediately. It has been my pleasure and honor to work with each of you as well as the many other outstanding individuals within the organization. As a Board you have grown NOCRA into one of the finest referee organizations in the Southern California area. Your professionalism, attention to detail and focus on improving the quality of our organization and referees has been amazing. Time and time again I have been impressed with your ability turn our small group into a substantial group all the while improving the quality of the service we provide. Each of you has demonstrated a passion for developing people and shown grace and humility all the while. The NOCRA Board is a great reflection of “Servant Leadership”. I am proud to have been associated with NOCRA, I count you as friends. 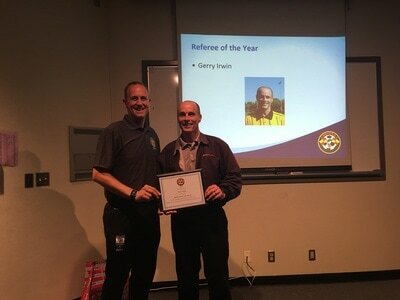 Gerry Irwin was recognized at our January meeting for his accomplishments in 2016, presented with the Referee of the Year Award. 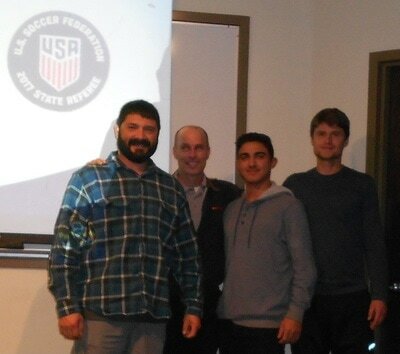 Gerry also completed the USSF Grade 6 State Referee requirements. Gerry has contributed a lot to NOCRA and our soccer community. 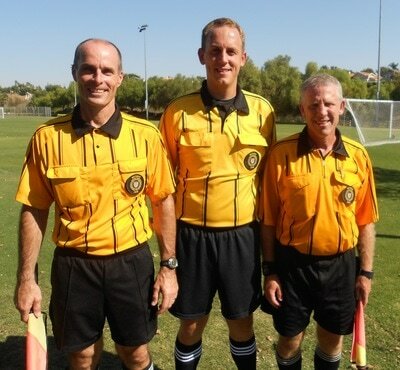 He was a board member and worked with many of our new referees. Thank you Gerry for everything you have done for all of us, for your incredible professionalism and dedication to your fellow soccer referees, the players, the coaches and the game. All the best to you and Christine in the future.